Dr. Bhati controls the robot used in kidney surgery. Jerry Samford was a 20-year-old William & Mary student when one of his kidneys began to fail due to a restricted artery. Most people with only one kidney lead a normal life but Samford was one of the unlucky few. His other kidney was failing more than 30 years later for unrelated reasons. He was referred to Dr. Domenic Sica, a kidney specialist at the Virginia Commonwealth University (VCU) Medical Center for treatment and eventually to the VCU Hume-Lee Transplant Center to prepare for a kidney transplant. “They advised me to begin talking to family members about donating a kidney,” Samford said. Tests showed that his wife, Ann, and nephew, Jason McNary, were blood and tissue type matches. However, Ann’s kidneys were too small to work effectively in Jerry Samford’s body. The best match was his nephew, Jason, who lived in Los Angeles. Samford flew to Los Angeles to ask McNary if he would give up a kidney. One of many advantages of living organ donation is that surgery often can be planned to fit the schedules of both the donor and recipient. “With a kidney from a cadaver, you only have a limited amount of time so you take it or lose it,” Samford said. In this case, surgery could be delayed while McNary and his bride went on their planned honeymoon. After the honeymoon, McNary came to Richmond, more testing was done, and surgery was performed in May 2016. Samford and McNeary were placed in adjacent operating rooms. 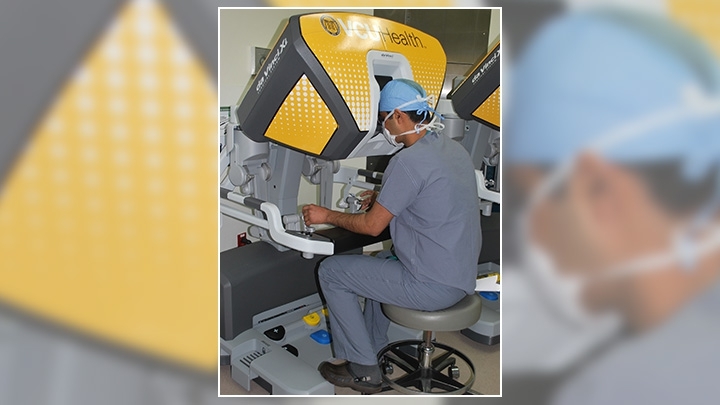 Dr. Chandra Bhati, using a robot, removed one of McNary’s kidneys. In robotic surgery, a camera and surgical instruments are attached to mechanical arms. The doctor sits at a console and controls the arms. “The robot mimics the human hand. You don’t have to cut away muscles and there is minimal pain,” said Dr. Bhati. He emphasized that the surgeon, not the robot, actually performs the surgery. “I think that’s really cool,” McNary, a physicist, said about having one of his kidneys removed by a robot. The donated kidney immediately was transplanted into Samford’s body by Dr. Adrian Cotterell. “When we have a living donor surgery, we’ll have two separate surgeons for the organ removal and organ implantation. The surgeries usually happen in operating rooms right next door to each other so the organ is out of the body for as little time as possible,” said Katie Mardigian, VCU transplant outreach coordinator. Jerry Samford and his nephew and donor Jason McNary post surgery. Samford spent four days in the hospital and about two weeks recovering at home. He returned to work in four weeks. “Your body will never see a donated organ as your own,” Samford said. He will take medication for the rest of his life to suppress his immune system so his body won’t reject the donated kidney. “Nationally, patients who need a kidney must wait up to six years for a kidney from a deceased person. Living donations decrease that time to one to two months,” Dr. Bhati said. Patients have better outcomes because a donated kidney typically is of better quality than one from a dead person. They also undergo dialysis for a shorter time, he added. Samford was on dialysis for just a few weeks. “It’s boring as hell and prevents you from having a normal life.” He is a geologist and and volunteers as a member of the Science Matters Leadership Team. Dr. Trevor Reichman, who performs living liver transplants at the VCU transplant center, explained that, unlike kidneys, humans have only one liver. Only half of the donor’s liver is removed and implanted in the recipient. Both liver halves regenerate to normal size over the next two months, he said. Dr. Reichman emphasized the need for liver donations. Over 1,200 patients died in 2016 waiting for a liver. “Of those, 27 were children,” he said.